I thought I'd throw in one more art feature before Christmas. I'm sitting here on my couch, finally relaxing (thinking I need a coffee and Baileys), covered from head to toe in glitter. I guess it's an occupational hazard this time of year ... good thing I like a little "bling" in my life. We're hard at work on our Christmas craft / parent present right now in the classroom. We're making subway art coasters. 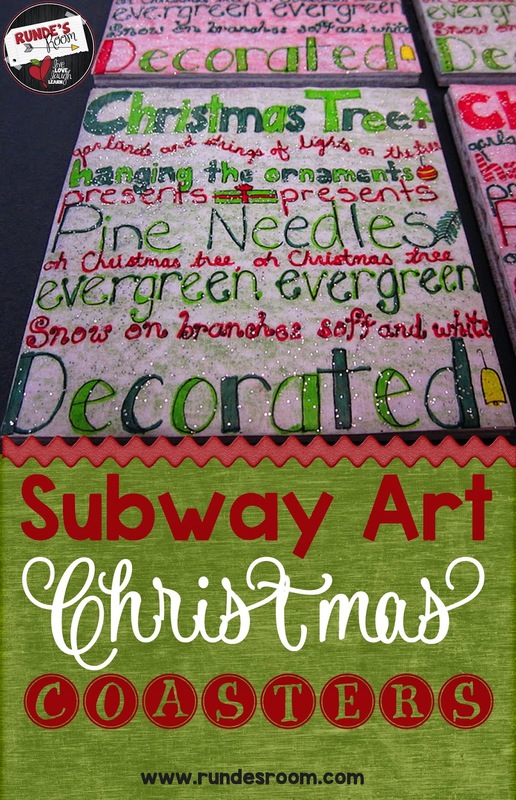 We started out by creating subway art (with a Christmas theme) on a square piece of blank paper (full size blank paper, cut into a square). Students were free to add any words or pictures they wanted, but I did encourage them to use as much of the page as possible. I then took these squares and reduced them on the photocopier to just under 4 inches (reduced to 43% on my photocopier). I made 4 copies of each student's square, and the students cut out the smaller squares so I could make one copy with all four smaller squares on it (I left the cover of the photocopier open so the background would be black so the students could see exactly how big their squares were). They then coloured in these squares using sharpies (or any other waterproof marker). Many students also chose to lightly colour the background with a pencil crayon. After we cut out the finished squares, we used mod podge to glue them onto our 4 x 4 tiles. These were just plain white 4" ceramic tiles that I purchased from a home improvement / hardware store for 19 cents a tile. I added silver glitter to the mod podge (I poured about a tablespoon of glitter right into the mod podge bottle, and gave it a good stir). I have never done this before, but it worked perfectly - what's a Christmas craft without a little (or lot of) glitter?!? To apply the mod podge, we used foam brushes from the Dollar Store. Because the 4 coats of mod podge (and the drying of the mod podge) could be difficult to complete all at the same time with a class of 28, I set up a small 4 person table in the classroom we used as an art station over 2 days. We continued with our school day as usual, but when students were finished their work, if there was an available spot at the art station, students could slip back to the table to put a quick coat of mod podge on their tiles. It worked perfectly, all students finished over the 2 days with minimal interruptions to our regular school day and school work. What a great idea! Those are amazing. The parents are going to love them. Great idea! They came out so super cute! I would love to receive one of these as a gift. omgosh! You constantly inspire me with your art!! I always look forward to see your projects! Adorable! What kind of tiles did you use? Did you pay for them or get them donated/free? I am thinking of trying this with my grade 4's this year. Where did you get your tiles from? How did you get your kids to write in such straight lines? We want to do this but are worried the kiddos won't be able to get things centered the right way. Any suggestions? ?